This is a French version of the classic Greek starter. 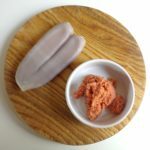 There are two ways to make it — the traditional way, using bottarga (poutargue, or cured salted fish roe), and what has apparently become the modern way, using fresh salted fish roe, which is far less expensive and, as I discovered when experimenting for this blog post, just as delicious. Recipes for tarama, aka taramosalata, vary wildly, as do the proportions. This recipe is based on the tarama I used to make at a small restaurant here in Paris, as taught to me by my French friend Nicole. I have tried to reconstruct the proportions from memory, and am offering both versions — with bottarga and with fresh cod roe. A note on the ingredients: Bottarga is available at Greek food shops and gourmet delis, and you can also buy it online. A thin coating of wax is used to preserve the cured roe. The fresh roe may be harder to find, but it is a tiny fraction of the cost of bottarga, so the hunt is well worth it. Try Greek shops or your fishmonger. The two types of roe are pictured at right. In my experience, a neutral oil is preferable to olive oil, which can overwhelm the delicate flavor of the roe. The other ingredients are white bread soaked in milk and fresh lemon juice. Use only the tender center of the bread. This recipe calls for an ounce (30 g.) of bread, which is roughly equivalent to half a baguette with the crusts cut away. 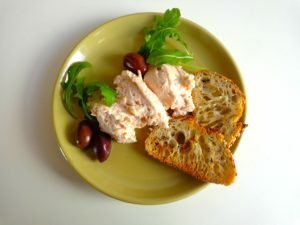 Serve the tarama on toast or with a little salad of tender leaves and some Greek olives. The quantities below will serve 3-4 people as a starter or 6-8 as a palate teaser at cocktail hour. If using bottarga, remove the wax and peel away the thin membrane enclosing the roe. Crumble or grate the roe finely. Place it in a small bowl and add 1 tbsp. warm water. Stir to loosen the eggs. Transfer to a blender. If using fresh roe, simply place it in a blender. Add 1 tbsp. of the lemon juice to the blender. In a small bowl, soak the bread in the milk for a few minutes. Pour through a sieve and use the back of a fork or your hands to squeeze out the milk. Transfer the bread to the blender. Add half of the oil to the blender. Pulse briefly. Add the rest of the oil and pulse again until the mixture is smooth. Transfer the tarama to a bowl and stir in the rest of the lemon juice. Taste, and add more lemon juice if desired. If using the optional olive oil, stir it in now. Refrigerate until ready to serve. Serves 4-8. Tarama is also sometimes served on mini-blinis in France. But the blinis sold in shops here bear little relation to real blinis, Russian style. If you’d like to attempt to make your own, you can find the recipe here.